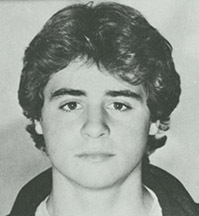 Nicholas Andreas Vrenios (1968-1988) was among the 270 victims of the bombing of Pan Am Flight 103 over Lockerbie, Scotland on December 21, 1988. Nick was a junior majoring in photography at Syracuse University. He was returning home to Washington, D.C. after a semester in London. Nick took to London his three prized possessions - a camera, a guitar, and a skateboard. His favorite expression was "go for it!" The Nicholas Andreas Vrenios Collection contains materials related to Nick Vrenios, one of the 35 University Students killed in the bombing of Pan Am Flight 103 over Lockerbie, Scotland. The collection comprises includes correspondence, photographs, subject files, and writings. Elizabeth Kirkpatrick Vrenios donated the collection in 2004 and 2010. The copy of "Special Delivery" was purchased by the Archives in 2016. The Nicholas Andreas Vrenios Collection is fully processed.